I was bloghopping tonight, and saw this cover to the latest “hot sheet” (tabloid) and had to laugh. Those crazy alien drivers! Think of it– they invent super-duper spaceships that can travel the universe and soar into our atmosphere, avoiding detection by government spy satellites (and Google Earth), and then crash headlong into one of our windmill blades like drunken goofballs. Can it be?! I hope they were up to date with their New Jersey auto insurance payments, otherwise the Mother Ship may not be too happy…. Photo from The Paranormal World. Hilarious! Maybe the UFO’s Tom-Tom wasn’t up-to-date. Do people really believe this B.S.? 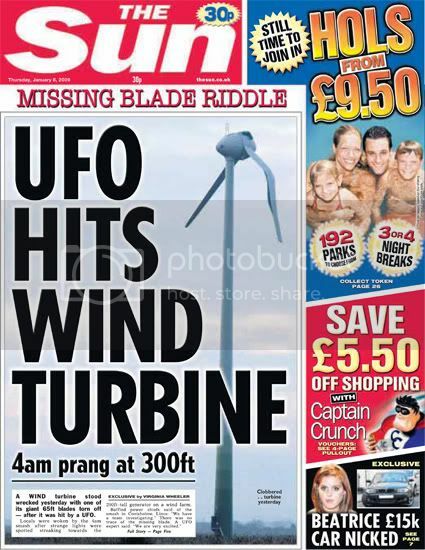 I guess if they find a UFO with a huge crease in it (about the size and shape of that blade) I’ll believe it. Otherwise, GEEZ! Joy-riding, trouble-making aliens? What the hell is the world — err, the universe — coming to? This happened just a few miles from where I live! There are several military air bases in the area so maybe this is what the aliens were looking for!! Well, well, well! Military bases in the area, huh? What a coincidence! Upstate NY has a lot of military bases, and– such a coincidence– these areas have a lot of “UFO” sightings, too! Now I wonder why these things are?